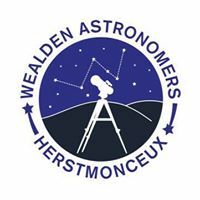 The Next Meeting of the Wealden Astronomers will be at Herstmonceux Village Hall on Friday 27th October 2017 and thereafter on the fourth Friday of every month. 7:30 pm start. Tea & biscuits from 7:00 pm. o A Sky Tour (using planetarium software and a projector) by Chris Ellis. o Observing (if the weather is kind to us). Bring your telescopes! o All Society telescopes set-up & demonstrated to members. And catalogued.